Baden-Powell first suggested the idea of Senior Scouts in 1917 to try and prevent the leakage of older boys from the Scout Movement and you could become a Senior Scout providing you were 15½ and had gained your First Class. However by 1917 you could not leave the Troop to become a Senior until you were 17 and by the end of 1918 the term Senior Scout was dropped and replaced by Rover Scout. It was not until 1946 that Senior Scouts was again officially recognised as the Section between Scouts and Rover Scouts. Nowadays Seniors is for male and female youths aged 15 – 18. There motto of ‘Look Wide’ describes the sections philosophy; in which they are encouraged to actively take control of their own management and programme. Being in Senior Scouts is a great adventure! You can make friends, have fun, do your best and be proud. 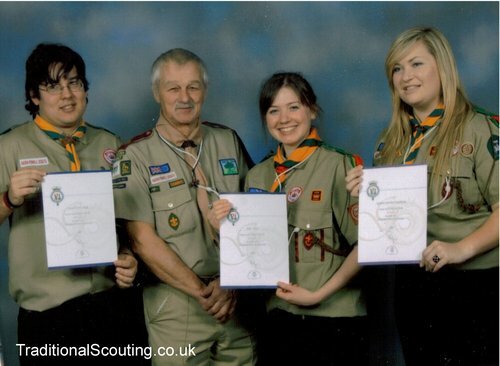 Senior Scouts meet regularly; they work hard both independently and with others to achieve a great range of goals and awards (whilst overcoming whatever life throws at them along the way!) Senior scouts build upon their skills and hobbies they developed in scouts and often have opportunities such as camping, climbing, exploring, competing, cycling, canoeing and cooking as well as much, much more. Senior Scouts work extremely hard and have plenty of enjoyment making their way through a number of awards including the Bushman's Badge and the Venture Badge to gain their St Georges Award. Alongside this there are a great number of proficiency badges including the Rock climber, Electrician and Hiker. Senior scouts also offer opportunities to work towards the Duke of Edinburgh Awards. If you like the sound of it all and want to get involved - contact us! To see what badges you can achieve check out the programme section!